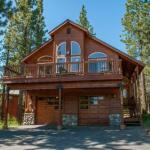 Featuring mountain views Frank is located in Truckee 14 km from Northstar at Tahoe Resort. The property is 10 km from Donner Ranch Chair #1 and 10 km from Summit Chair. The holiday home features 3 bedrooms a kitchen with a dishwasher a washing machine and a bathroom. Towels and bed linen are offered in this accommodation. Mount Judah Express is 11 km from Frank. The nearest airport is Reno-Tahoe International Airport 43 km from the property.